There’s no easy way to tell this story except to plow into it & leave the condemnations fall where they may. When the US launched the US-NATO war in Afghanistan in October 2001, it fumbled for justifications, beginning with hunting down Osama bin Laden hiding out in the caves of Afghanistan (in retaliation for 9/11) & soon lit upon the emancipation of Afghan women from the Taliban. US Marines & B-52 bombers would now become agents of women’s liberation. Hundreds of foreign nationals within & outside the US were detained without charge, trial, or access to legal counsel & family members in the US naval base at Guantanamo. The US refused to recognize them as prisoners of war & deprived them of rights required by the Geneva Conventions. There were reports of torture, abuse, & deaths in custody; there were reports of secret CIA torture centers in Afghanistan & elsewhere. From early on, UN agencies & Afghan & international human rights groups (especially Human Rights Watch & Amnesty International) monitored the situation in Afghanistan. Their focus was on war crimes by the US military & its NATO allies involving aerial bombardment, special forces night raids, torture of detainees, civilian deaths, human rights crimes against Afghans. At no time, did any of the organizations condemn the US-NATO war. In 2011, the UN & human rights organizations shifted focus in their reports from exposing US-NATO war crimes to condemning the Taliban for human rights crimes & calling for them to be viewed as war criminals for indiscriminate use of suicide bombers, assassinations, & improvised explosive devices. The reports began blaming the Taliban for over three-quarters of all civilian casualties—meaning deaths & injuries. Several of these groups approached the International Criminal Court in The Hague, which has been conducting an inquiry into war crimes charges in Afghanistan, about prosecuting the Taliban. But since it refuses to address US-NATO war crimes in Afghanistan, it would discredit itself by only going after the Taliban. Guantanamo & US drug trafficking remain the elephant in the courtroom. On February 14th, 2016, UN operations in Afghanistan (UNAMA) issued its annual report documenting 11,002 civilian casualties (3,545 deaths & 7,457 injured) in 2015. UNAMA has estimated 59,000 civilian casualties since they began tracking in 2009. The 2015 estimates represent an increase of 4 percent from 2014 & include an average of 53 children killed or injured every week—the highest child casualties since 2009. The report attributes 62 percent of civilian casualties to “anti-Government elements,” meaning the Taliban. Another 17 percent is blamed on “pro-government forces,” meaning the US-trained, advised, & assisted Afghan army, police, & militias. “International military forces,” are blamed for 2 percent of the casualties in joint operations with the Afghan military. They do not identify the “international military forces” as the at least 13,000 US troops, along with unspecified numbers of US special forces, & thousands of mercenaries. The UN report leaves the responsibility for 19 percent of civilian deaths unaccounted for. The report focuses mostly on those “anti-government elements” (over 30 pages) & pays some attention to the Afghan military & militias (13 pages). There is no elaboration of the US military & mercenary role in Afghanistan. But there is this statement: “UNAMA takes the position that the armed conflict in Afghanistan is a non-international armed conflict between the Government of Afghanistan & its armed forces (Afghan national security forces supported by international military forces…) & non-State armed opposition groups.” In other words, the UN declares there is no US military occupation of Afghanistan when even Obama admits to US military presence in Afghanistan. Only expletives come to mind in response. How does the UN explain who bombed the Doctors Without Borders/MSF hospital in Kunduz last October? Because MSF doesn’t beat around the bush. They accuse the US of war crimes for bombing that hospital & for the 72 casualties. How does the UN explain away accusations against US special forces for several suspicious & gruesome deaths of civilians in Afghanistan last year? In previous kangaroo investigations, US & Afghan military investigations exonerated the US of any wrongdoing, blaming instead “Afghan auxiliaries”–those militias called “pro-government” by the UN. 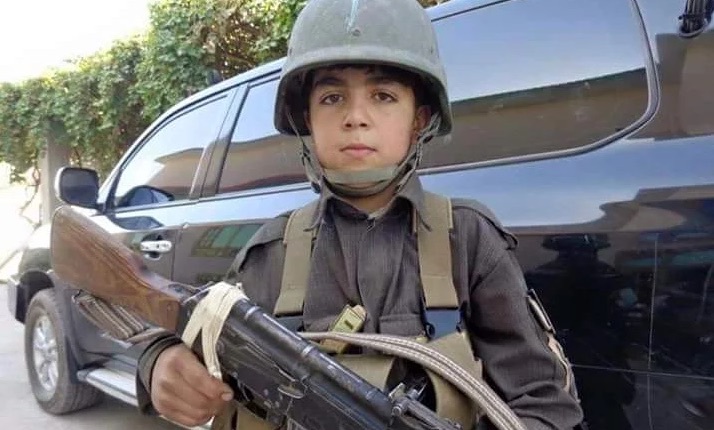 How does the UN explain away accusations by human rights groups that use of child soldiers by Afghan military, police, & militias is “rife” & charges that the US had to know about that? When the UN says there is no US occupation, they are making international asses of themselves & attempting to cover for US war crimes. The primary reason given by Obama to prolong the stay of US troops in Afghanistan is the need to train Afghan’s military & police. When Afghan forces commit war crimes, those crimes are as attributable to Obama & the Pentagon as they are to the Afghan regime. The UN report is a lying-assed disgrace. This is a photo of 10-year-old Wasil Ahmad, a child soldier in one of the militias trained by the US. He was gunned down earlier this month. The historic imperative remains: rebuild the international antiwar movement. US out of Afghanistan! Demand the immediate, unconditional withdrawal of all US troops, special forces, & mercenaries from Afghanistan! Short now defined as disability? A local clinic advertises medical intervention for children of short stature–like being short was a disease. I was always short & still am at 5′ 2″ (if I stand up straight, 5′ 3″). It was considered adorable to be small when I was a little girl so when I learned it was an undesirable trait, I was too old to develop an inferiority complex. Maybe to others I need elongating therapy but to me, I’m still adorable. Mouthy, but adorable. Shorter men really get it in the jugular about height. There’s all that “Napoleon complex” crap you get accused of when you’re just being normally macho. But wow, can it be cruel! And demeaning! It seems the height of irresponsibility to bring little kids for treatment just for being short. Kids develop–physically & mentally–at different paces. There are many who are short in their teens & go through growth spurts later. But what the hell is wrong with being short? Why risk giving them a complex about being short? Why can’t that be seen as one of the infinite varieties of being human–& beautifully human? Lesser evil politics is the entrenched system of US politics but it’s pernicious & intended to undermine a principled attitude toward politics. It’s also sneaky as all get-out. Elizabeth Warren sent an alarmist email today saying Republican senators on the Judiciary Committee emerged from a secret meeting to announce they would not consider an Obama Supreme Court nominee & it would have to wait until the next president takes office in 2017. We’re expected to freak out about that like the republic depends on machinations between saviors & chumps. We’ve seen a parade of saviors & chumps in both the White House & the Supreme Court & their politics are indistinguishable on all the important issues. There are no saviors, especially of the lesser evil kind, in politics anywhere. If people want things to change in the direction of democracy, peace, & human rights, there is no alternative to active, public engagement in the movements fighting for them. The US antiwar movement, which though small & weak continues to exist, & is made up of many solid activists who vote lesser evil but still stand steadfast against war. If you’re going to vote lesser evil, that’s the only way to do it. Meet the new leaders of the international women’s movement: Christine Lagarde, head of the International Monetary Fund (IMF), & Sheikh Mohammed bin Rashid Al-Maktoum, feudal monarch of the United Arab Emirates & Emir of Dubai. The Sheikh is sponsoring the Global Women’s Forum 2016 going on today in Dubai with 2,000 participants & 200 speakers from 70 countries where Lagarde is a keynote speaker. It isn’t reported who is representing the US since Hillary Clinton is otherwise engaged. This is her kind of feminism. If long-time feminists are wondering where their invitation is, just thank your lucky stars they overlooked you. 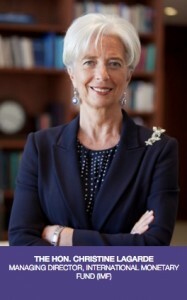 We’d take a look at Madam Lagarde’s feminist credentials but even if she had them (which she does not if you consider feminism the theoretics of women’s oppression), her record of destroying the lives of men, women, & children on every continent speaks louder than a little rah-rah for equality. IMF austerity programs in countless countries destroy public education; healthcare, including prenatal care & nutrition programs for children; pension programs for seniors. IMF austerity policies have expropriated millions of Indigenous peoples & farmers in the interests of multinational agribusiness & mining firms–forcing millions into homelessness & urban slums, then out of those slums to the streets for IMF-mandated urban development & gentrification. She can take her kind of feminism & put it where the sun don’t shine. 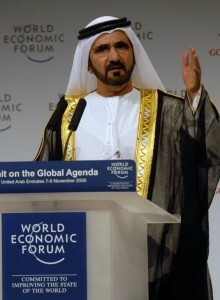 As for the Sheikh of Dubai–his multiple wives might not shake out that well in international feminist circles, even if he did make them functionaries in his little dog & pony show. But what is much more damning are the fighter jets his royal hot-stuff is contributing to the barbaric Saudi-led bombing assault in Yemen, now nearly a year old. They’re bombing hospitals, schools, residential neighborhoods & we’re supposed to buy his hot air about women’s rights!? Don’t make a mockery of feminism. Don’t turn the fight against women’s oppression into a dog & pony spectacle. Keep that for if Clinton becomes president & it’ll be all the rage in those circles. But keep the rest of us out of it. This is the hard-hitting war journalism of modern media. 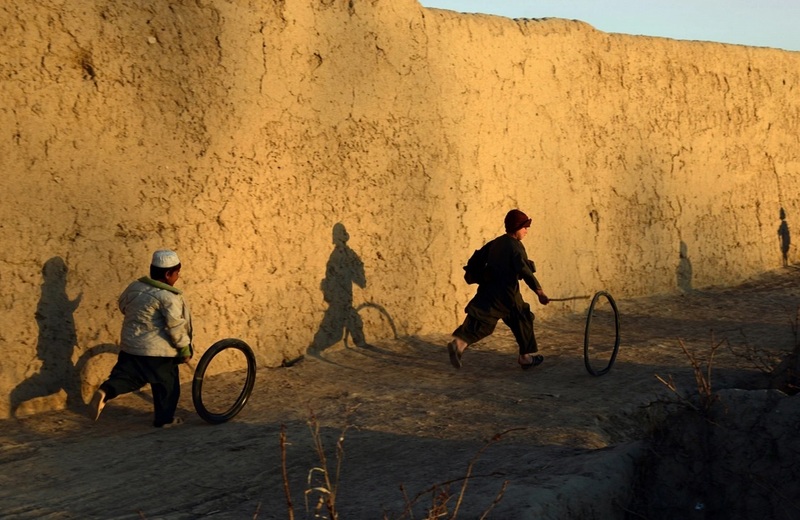 And here most people mistook it for a bucolic photo of children playing in Zhari, Kandahar province, Afghanistan. In that regard, could it be taken as war propaganda & a denial of realities? It’s not that children in Kandahar don’t play in a war zone or that seeing them isn’t always delightful, but that is not the story that matters in Kandahar where the CIA, US special forces, & US army all have bases; where there are constant armored & foot patrols searching for Taliban & harassing the people. Kandahar is the scene of a 2012 massacre when a US army sergeant murdered 16 people, including nine children, & then attempted to torch some of their bodies; & where there are hundreds of land battles & bombing sorties. When Rolling Stone magazine did an investigative piece about US special forces in Afghanistan, they reported one US official saying about Wardak province: “They’re venomously anti-American there. It’s just always been that way. Sometimes our adversaries are the men & women of a community.” You can be sure the same is true for Kandahar province & that is the story that needs to be pursued. That’s what war journalists should be covering instead of children rolling hula hoops–& would be covering if there weren’t some kind of news censorship by the US military. Given that media will not break the news barrier, we will turn this photo meant to deceive us into an antiwar anthem. Children have a human right to play without fear of being blown up or shot down. We demand the immediate, unconditional withdrawal of all US-NATO forces from Afghanistan.